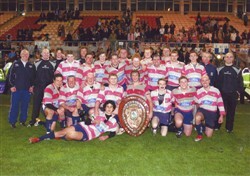 Olney RFC, colour team photograph Lewis Shield Winners 2007, with shield. Back row: Kenny Thomas, Dave Smith, Duncan Taylor, Ross Stewart, Dean Hendrickson, Rory Duncan, Simon Christian. Middle row: Giles Danty, Charlie Tompkins, Tom Stanton, Steve Harrison, George Stanton, Pat Leahy, Will Edwards, Tom Salsbury, Ben Pry, Jarleth McElroy. Front row: Reece Peekman, Steve Hawkins, Phil Berry, Scott Filler, Charlie Belcher, Adam Wells, Adam Kelsall, Michael Chaplin. Lying down: Rhana Peekman.